Vacation with my parents and siblings has usually meant the beach, specifically Perdido Key, Florida, when I was younger and Hilton Head Island, South Carolina, in more recent years. Greg and I have gone on vacation about every two years since we’ve been married. This year we decided to go to Lake Placid, NY, which is more in the vicinity of where my sister and her family live than our southern beach tradition. Technically, there was still a beach, but this time the location involved fresh water instead of salt water and was in the mountains instead of at sea level. We hiked, toured winter Olympic sites, ate well, walked more steps than usual, and took a ferry to Burlington, Vermont. I don’t say that because I’m surprised; I’m pretty much game for any trip. 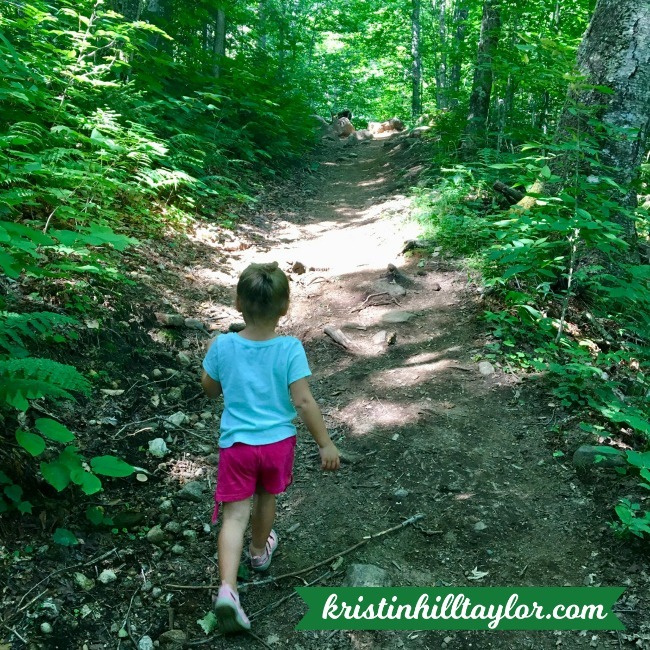 I just wasn’t sure what to expect and was pleasantly surprised by just how beautiful and fun this vacation spot among the Adirondack Mountains is. While we were there, I learned a couple of hard things about people who I care about in my everyday life. The freedom and adventure of vacation in a beautiful place were momentarily interrupted by the overwhelming feelings of this world’s brokenness. I remembered then how Christ followers are called to a different kind of life. surprises and beauty – even when stories are hard. We know God is kind and faithful, yet we manage to be surprised when He shows up and provides what we didn’t know we needed. We know God has a plan, but we sometimes seem overwhelmed when He reveals it to us. We had three two-year-old kids with us, so of course it was an adventure! But I really loved being with my sister and sharing this season of parenting toddlers. I learned hiking — even about six miles round trip to and from a waterfall that was about half the size of what we were expecting — is Rachel’s happy place. Ben learned he likes Shirley Temple sodas and lake water in the north is colder than here in Kentucky. Cate was helpful with the many small children and had a wonderful attitude about it. Greg and I got to enjoy our time with each other, our kids, and extended family. Ah, April, what an adventure you’ve been. You’re the introduction to my favorite month, so I like you. You’ve come and gone so quickly, but we’ve had fun. Before May arrives, let’s remember this month. 1. The Nashville Flea Market is great. Maybe all flea markets are great, I don’t know. My first flea market experience is in the books. And I hope I get to go back. 2. Kayaks are good lake entertainment, even if getting them home from Walmart is an adventure. Let me tell you about that adventure: I’d been thinking kayaks would be a good addition to our lake house. (It’s available for vacation rentals. Did you know that?) And then there they were, on display and on sale at Walmart. So we bought two. 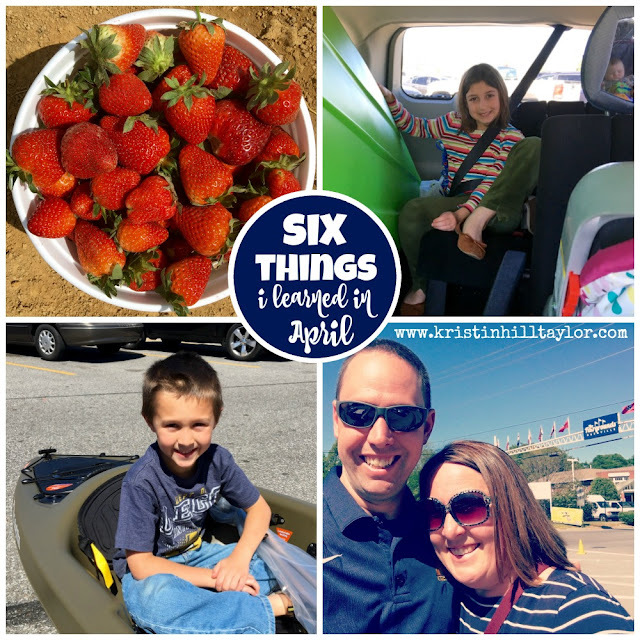 And then we realized they wouldn’t both fit in our mini van with two adults, two kids, and a baby … and a stroller, and all the other randomness in my van. So I took on kayak and the girls home, cleaned out the van, and the girls and I went back to Walmart to pick up the husband, son, and second kayak. Both kayaks now happily reside at Shelter Point Retreat. And my daughter, niece, and nephew were happy to break them in. 3. I can be intrigued enough by a story to keep reading even when I don’t really like the book that much. “Everything You Ever Wanted” by Jillian Lauren was that for me. It’s an adoption story, and there were parts that were fascinating and interesting. But other parts I ended up skimming. Regardless, it’s brave to tell your story, especially when it has many hard parts, so I’m glad I read it, but I’m not sure I’d recommend it. Does that make sense? 4. A new strawberry patch opened just down the road. I love picking berries and now it’s even more convenient. 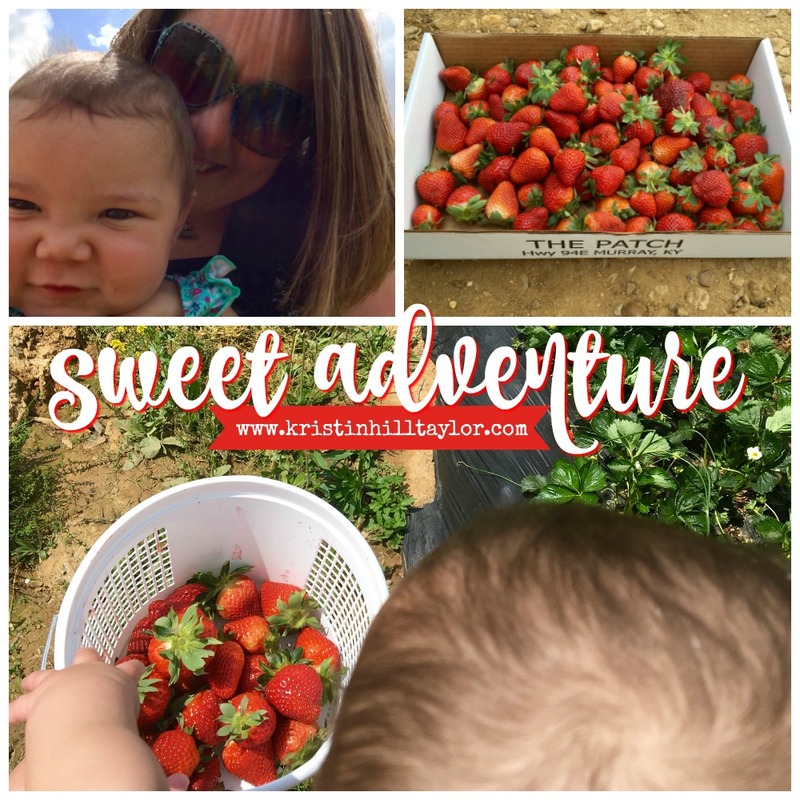 If you live in Murray, be sure to check it out the next few weeks while the strawberries are in season. Maybe you’ll have an impromptu adventure like I did. 5. Adventure would be my word for 2016, if I had chosen a word. It’s all around me, as you can tell with my multiple references to it in this post alone! 6. I’m a communication nag. If I email you about an event or project, send you an invitation for a party, or ask for feedback … and I don’t hear back, then just wait, I will solicit a response in follow up emails, Facebook messages and texts. I’d say I’m sorry, but, really, there’s usually a reason I asked or invited or emailed in the first place, and the reason usually involves a response. Perhaps you can blame the journalism degree with an organizational communications minor. So, how was your April? Did you have any adventures?